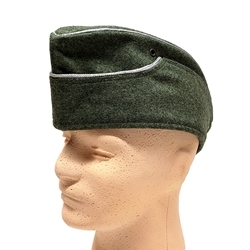 German M38 Army Overseas Side Cap, Field Grey Wool, for Officer's. These Overseas Caps are made in Germany from the highest quality wool which has been custom made to match the original field grey wool colors. Each comes fully lined with typical gray cotton twill fabric, braided aluminum silver officers piping and proper ink maker marks of size and date. They also feature the Army scalloped cut in the front. Please Note: Comes plain, Cockade and White Infantry Piping not included.